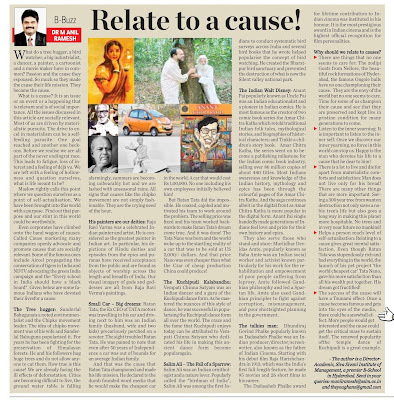 What do a tree hugger, a bird watcher, a big industrialist, a dancer, a painter, a cartoonist and a movie maker have in common? Passion and the cause they espoused. So much so they made the cause their life mission. They became the cause. What is a cause? It is an issue or an event or a happening that is relevant and is of social importance. All the issues discussed in this article are socially relevant. Most of us are driven by materialistic pursuits. The drive to excel in materialism can be a self-feeding parasite. One goal reached and another one beckons. Before we realize we are all part of the never ending rat race. This leads to fatigue, loss of interest and a feeling of déjà vu. We are left with a feeling of hollowness and question ourselves, what is life meant to be? Maslow rightly calls this point where we question ourselves as a point of self-actualization. We have been brought into this world with a purpose. Find out that purpose and our stint in this world could be worthwhile. Even corporates have climbed onto the bandwagon of causes. Called Cause marketing many companies openly advocate and promote causes that are socially relevant. Some of the famous ones include Aircel propagating the conservation of tigers in India and NDTV advocating the green India campaign and the “Every school in India should have a black board”. 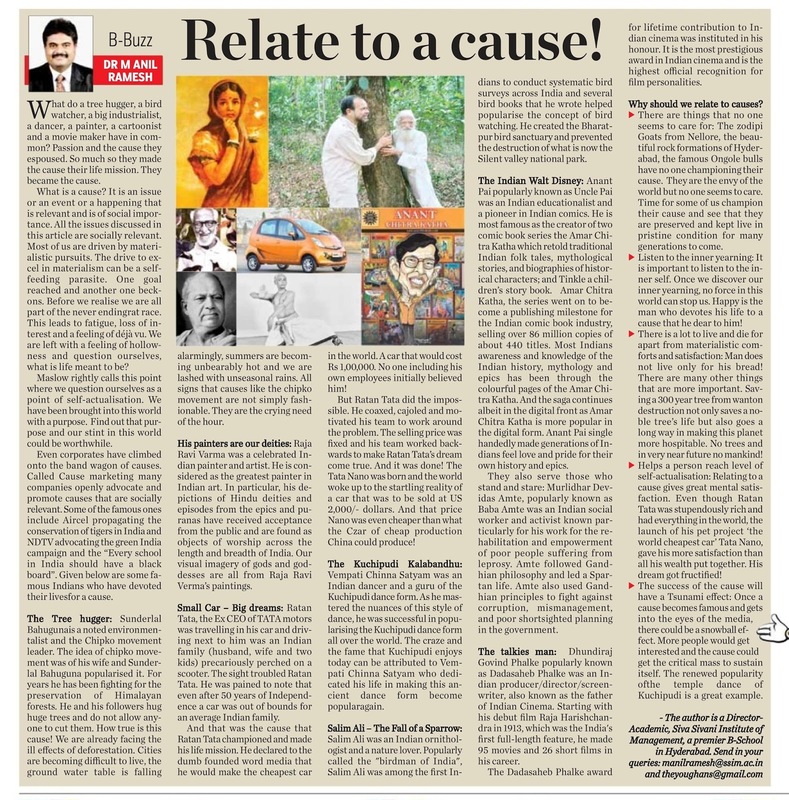 Given below are some famous Indians who have devoted their lives for a cause. 1. The Tree hugger: Sunderlal Bahuguna is a noted environmentalist and the Chipko movement leader. The idea of chipko movement was of his wife and Sunderlal Bahuguna popularized it. For years he has been fighting for the preservation of Himalayan forests. He and his followers hug huge trees and do not allow anyone to cut them. How true is this cause! We are already facing the ill effects of deforestation. Cities are becoming difficult to live, the ground water table is falling alarmingly, summers are becoming unbearably hot and we are lashed with unseasonal rains. All signs that causes like the chipko movement are not simply fashionable. They are the crying need of the hour. 2. His painters are our deities: Raja Ravi Varma was a celebrated Indian painter and artist. He is considered as the greatest painter in Indian art. In particular, his depictions of Hindu deities and episodes from the epics and Puranas have received acceptance from the public and are found as objects of worship across the length and breadth of India. Our visual imagery of gods and goddesses are all from Raja Ravi Verma’s paintings. 3. Small Car – Big dreams: Ratan Tata, the Ex CEO of TATA motors was travelling in his car and driving next to him was an Indian family (husband, wife and two kids) precariously perched on a scooter. The sight troubled Ratan Tata. He was pained to note that even after 50 years of Independence a car was out of bounds for an average Indian family. And that was the cause that Ratan Tata championed and made his life mission. He declared to the dumbfounded word media that he would make the cheapest car in the world. A car that would cost Rs 1,00,000/-. No one including his own employees initially believed him! But Ratan Tata did the impossible. He coaxed, cajoled and motivated his team to work around the problem. The selling price was fixed and his team worked backwards to make Ratan Tata’s dream come true. And it was done! The Tata Nano was born and the world woke up to the startling reality of a car that was to be sold at US 2,000/- dollars. And that price Nano was even cheaper than what the Czar of cheap production China could produce! Yes Tata Nano did not do as well as expected but is a prime example of what can be achieved with steely determination, daringness to dream and making something a cause to dedicate one’s life. Ratan Tata says that his most memorable day was the day when Tata Nano was launched. 4. The Kuchipudi Kalabandhu: Vempati Chinna Satyam was an Indian dancer and a guru of the Kuchipudi dance form. As he mastered the nuances of this style of dance, he was successful in popularizing the Kuchipudi dance form all over the world. The craze and the fame that Kuchipudi enjoys today can be attributed to Vempati Chinna Satyam who dedicated his life in making this ancient dance form become popular again. 5. Salim Ali – The Fall of a Sparrow: Salim Ali was an Indian ornithologist and a nature lover. Popularly called the "birdman of India", Salim Ali was among the first Indians to conduct systematic bird surveys across India and several bird books that he wrote helped popularize the concept of bird watching. He created the Bharatpur bird sanctuary and prevented the destruction of what is now the Silent valley national park. 6. The Indian Walt Disney: Anant Pai popularly known as Uncle Pai was an Indian educationalist and a pioneer in Indian comics. He is most famous as the creator of two comic book series the Amar Chitra Katha which retold traditional Indian folk tales, mythological stories, and biographies of historical characters; and Tinkle a children’s story book. Amar Chitra Katha, the series went on to become a publishing milestone for the Indian comic book industry, selling over 86 million copies of about 440 titles. Most Indians awareness and knowledge of the Indian history, mythology and epics has been through the colourful pages of the Amar Chitra Katha. And the saga continues albeit in the digital front as Amar Chitra Katha is more popular in the digital form. Anant Pai single handedly made generations of Indians feel love and pride for their own history and epics. 7. They also serve those who stand and stare: Murlidhar Devidas Amte, popularly known as Baba Amte was an Indian social worker and activist known particularly for his work for the rehabilitation and empowerment of poor people suffering from leprosy. Amte followed Gandhian philosophy and led a Spartan life. Amte also used Gandhian principles to fight against corruption, mismanagement, and poor shortsighted planning in the government. 8. The talkies man: Dhundiraj Govind Phalke popularly known as Dadasaheb Phalke was an Indian producer/director/screenwriter, also known as the father of Indian Cinema. Starting with his debut film Raja Harishchandra in 1913, which was the India's first full-length feature, he made 95 movies and 26 short films in his career. The Dadasaheb Phalke award for lifetime contribution to Indian cinema was instituted in his honour. It is the most prestigious award in Indian cinema and is the highest official recognition for film personalities. Why should we relate to causes? 1. There are things that no one seems to care for: the zodipi Goats from Nellore, the beautiful rock formations of Hyderabad, the famous Ongole bulls have no one championing their cause. They are the envy of the world but no one seems to care. Time for some of us champion their cause and see that they are preserved and kept live in pristine condition for many generations to come. 2. Listen to the inner yearning: It is important to listen to the inner self. What is our calling is not known. Salim Ali the birdman of India developed interest in birds when he shot down a sparrow. Examination of the dead sparrow inculcated a life time interest in bird watching, wildlife and conservation of nature. Once we discover our inner yearning, no force in this world can stop us. Happy is the man who devotes his life to a cause that he dear to him! 3. There is a lot to live and die for apart from materialistic comforts and satisfaction: Man does not live only for his bread! There are many other things that are more important. Saving a 300 year tree from wanton destruction not only saves a noble tree’s life but also goes a long way in making this planet more hospitable. No trees and in very near future no man kind! 4. Helps a person reach level of self-actualization: Relating to a cause gives great mental satisfaction. Even though Ratan Tata was stupendously rich and had everything in the world, the launch of his pet project ‘the world cheapest car’ Tata Nano, gave his more satisfaction than all his wealth put together. His dream got fructified! 5. The success of the cause will have a Tsunami effect: Once a cause becomes famous and gets into the eyes of the media, there could be a snowball effect. More people would get interested and the cause could get the critical mass to sustain itself. The renewed popularity of the temple dance of Kuchipudi is a great example.